I’ve been listening to popular music as long as I can remember. I’ve been moved by the rhythms, melodies, and chord progressions of contemporary songs since before I was old enough to know what those words meant. As I got older and learned about Mozart, Bach, and others, I began to realize that “contemporary” music is very simply the music of the present. The overtures and opuses of the 1700s were the popular songs of that era. People identified with those songs in the same way that today's “hits” appeal to the masses of this era. As a songwriter for liturgy in 2017, the question that consistently teases me is: How do I create a song that will honor the history of music and the traditions of the Church, but still appeal to today's parishioner and lead him/her to worship? As a Christian and a man who has spent (cough, sputter) eleventy billion years playing music in the Catholic Church, I have come to recognize a beautiful but sometimes subtle line between popular music and sacred music. I’ve been asked to play Shania Twain for a wedding, Kris Kristofferson for a funeral, and U2 for Sunday Mass. Many don’t understand that most of what is written for top 40 radio probably wasn’t intended for worship. But there is a different style of popular music that has taken shape over the last few decades. We’ve seen the introduction of contemporary christian music both on radio and in churches. As I travel the country, I am often seeing the use of acoustic guitars, electric guitars, bass, and drums in liturgies. There is a wave of interest from the young church in using modern worship music for Mass. I believe that God inhabits the praises of his people, and people are being moved by powerful refrains, repetitive bridges, and intimate lyrics — much in the way that I’m sure Ode to Joy affected assemblies when it was introduced as a hymn in the early 1900s. Trying to gain perspective from both the hymns of the past and the newer culture of modern worship, Grae McCullough and I set out to write the Mass of Restoration. Grae and I are both associate directors of music at Our Lady of Prompt Succor parish in Alexandria, LA. So, when the USCCB gave word that the text of the liturgy was going to change in November 2011, we challenged ourselves to write a Mass setting for the people of our parish community. Every week we lead music for school Masses and parish Masses, so we knew we needed something that would resonate with all ages. We also wanted it to be joyful, approachable, and easy to sing but still fresh, dynamic, and expressive. We came up with a melody that would become a sort of theme throughout many of the different mass parts. This was an important part of the process because we needed something to establish familiarity quickly. The idea was to use a motif in the style of early composers to hint at a modern worship chorus. We labored over each song individually while trying to ensure that they made sense as a whole collection — one body with many parts, if you will. We tried to create the most comprehensive liturgical setting possible. There are gospel acclamation verses for every season and invocations for the Kyrie. The finished piece was purposefully written so that it could be used in a traditional OR contemporary atmosphere. We really want it to work as easily for the 7 a.m. organist as it does for the Sunday night worship band. Although we could have recorded it with piano, strings, pomp and circumstance, we chose to go all acoustic for this recording. For every lone guitar player at every summer camp who has searched high and low for the perfect guitar-friendly Mass, this recording is for you. My prayer has not changed since we began writing Mass of Restoration early in 2011. I hope it is singable and approachable. I hope it serves the Church and blesses our Lord. I hope this setting, and the power of God with it, stirs us all into the deep and intimate worship of Christ who restores, renews and strengthens his faithful people. With five solo albums under his belt, Josh Blakesley is no longer a newcomer in contemporary Catholic music. 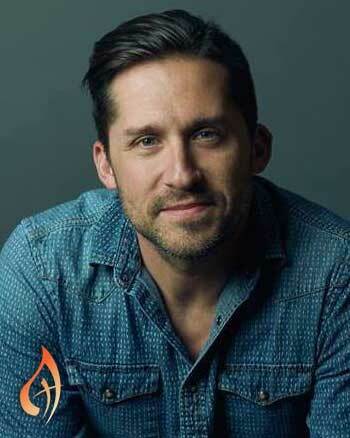 He and his band appear at some of the biggest faith-based events around the country.